Old road with raised agger and ruts leading down north-east from Llandewi Aberarth churchyard. 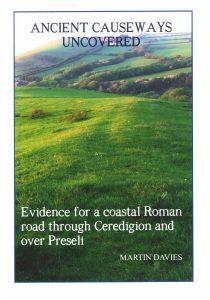 Evidence for a coastal Roman road through Ceredigion and over Preseli by Martin Davies is an impressive piece of detective work. Lavishly illustrated with clear maps, photographs of trackways and his eight excavations, LIDAR images and diagrams he presents a convincing case for this previously undetected route. Available from Amazon at £8.57.